However, Destina soon finds something that holds her interest far more than any fruit could do. The palace of King Francis I of France is nearby, and Destina manages to catch the royal prince, Henry, stealing their horses. But royal thieving aside, Destina sees something in the prince, something she’s never seen in anyone else before. 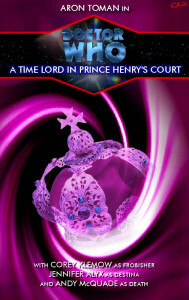 So when the Doctor announces he wishes to go to court to visit an old friend of his, Destina insists on tagging along. But why does the Doctor seem so against Destina associating herself with the royal Prince? And who is the dark stranger, who is keeping such a watchful eye on the time travellers? Will this love story end happily ever after? Episode 1 (13.8 MB) 8 December 2004 19 min 24 sec. Episode 2 (11.1 MB) 9 January 2005 15 min 35 sec. Episode 4 (18.7 MB) 5 March 2005 26 min 26 sec. Post-production by Aron Toman, David Nagel, Daniel Burnett and Owen Spratley.